We went from Barling to Chadwell-St-Mary (a small village, at that time, overlooking Tilbury docks) to be closer to Dad's job. He worked at Tilbury power station. We were only there for about a year when we were approved as immigrants to Australia. In November we boarded an Aberdeen and Commonwealth Line vessel named the Largs Bay. I think, at this stage I should point out that any comparison between modern cruise liners and the Largs Bay are way off the mark. This vessel was built in 1921, weight 14,362 tons, length 552ft. It was scrapped in 1957. Well past its use by date. There were many of these old pre-war vessels in operation after the war. Most had been modified to carry many more passengers than they were originally designed for. For instance, baths, showers, toilets were all communal; male and female areas were separate of course. Water was all salt, fresh water was only available for drinking. Entertainment was very rudimentary. Swimming pool was made of canvas and sat on the deck and was by far the most popular spot for us kids. Films were shown on a sail stretched between the cargo hoists and many were shown several times. From memory the adults spent most of their time sitting in deck chairs reading or playing deck quoits. There were all a few small bars on board for the adults. I think there were also dances some nights. Sunburn was a real problem area. You have to remember that most of the passengers had never been out of the UK; including me, John and Mum. Dad had been in the Royal Navy for 18 years, including the whole of World War II, so he was up with everything pertaining to long voyages, climate differences, weather conditions, foreign ports, etc. Even though there were plenty of warnings issued about staying out of the sun, I guess it was wasted on most of the passengers who just could not resist the temptation of getting out into the sunshine day after day. Seasickness also caused plenty of angst. Should point out here that our voyage to Australia took nearly seven weeks. After the first week at sea we were into some very hot weather which lasted until we reached our destination. Lack of air conditioning and limited refrigeration did not help matters. 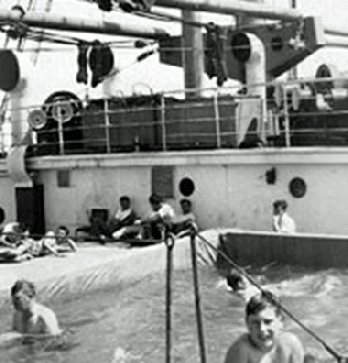 For days at a time the conditions below deck were stifling. Because of its age and condition it was necessary for the Largs Bay to berth fairly frequently. Fresh water, fuel oil, meat, vegetables and other provisions were the main reasons for these berthings. Most stays were from two to three days duration. 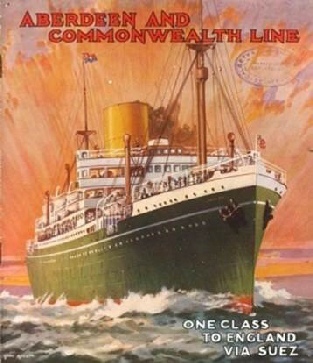 From memory our ports of call were; Algeries, Malta, Port Said, Aden, Bombay, Colombo, Perth, Adelaide and finally Melbourne. Most of these places were far from the tourist meccas they now are. Certainly a cultural shock to most of the "Poms" on board, but a great adventure for us kids! 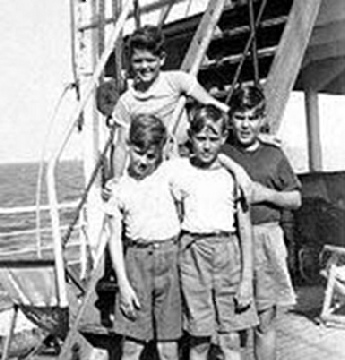 We first set foot on Australian soil, in Fremantle, on New Year's Day, 1952, after a Christmas at sea in the Indian Ocean. The first group of migrants disembarked here and we were in port for three days. While the adults went off to explore Freemantle and Perth we went swimming with the local kids in warm crystal waters full of tropical fish. What a revelation after the Crouch and the Thames! Another three days in Adelaide disembarking more migrants, then on to Melbourne. The remaining migrants then went on to Sydney. These disembarkations were always very sad occasions as many friendships had been made on board Largs Bay over the previous six or seven weeks. Upon arrival in Melbourne migrants destined for Tasmania were rounded up and taken to the airport. No one in the group had ever been on an aircraft before including my father, who, remember had been in the RN for 18 years including the whole of the War. Unbelievable in this day and age! Aircraft make was a DC3 Dakota, workhorse of the Second World War and very popular for many years thereafter for its reliability and ruggedness. There were still plenty of them flying in Australia well into the 60's as they were well suited to Australia's environment. We touched down at Western Junction Airport, in Launceston, Tasmania, on January 9, 1952. This cutting is from the "The Examiner" of January 9, 1952. I Could not find the original one that Mum kept for years. Fortunately the National Archives in Canberra had put most of Australia's old newspapers onto microfiche. This was done many years ago and they do not reproduce as well as the originals. I Had quite a bit of trouble getting it to this standard. Staff at the National Archives were great. A Couple of my mates have had a go at Photoshopping it but it is not a digital picture and was hard to work with. 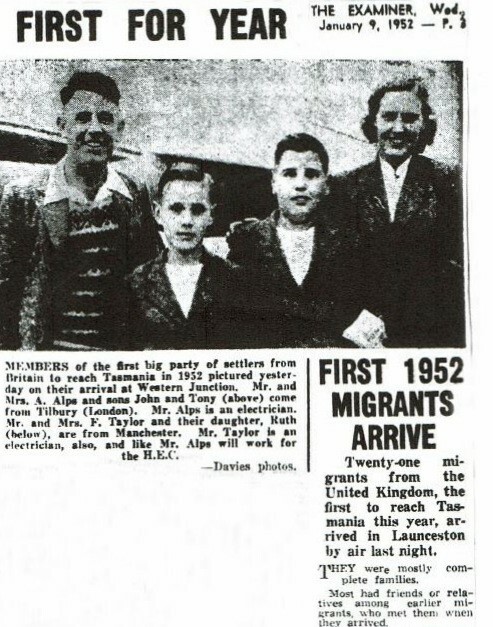 So here we were the Alps family; Mum who had never been further than Newcastle-on-Tyne (on honeymoon) me and John who had never been further than Clacton, and Dad (who had been all over the world but never went ashore at an Australian port) on the other side of the world. Just about as far away from Barling as it was possible to get! It was a terrible wrench for Mum in particular. She was a Barling girl through and through. She had endured all the hardships of the war and all her friends and family lived there. Remember, also, that communication in those far-off days was entirely by post and it took between eight to 10 days for an airmail letter to reach its destination. Mum was always looking out for the postman! From here our new life began and it would take far too long to detail all the hard work, heartache, joys and disappointments that followed in the first years in Tasmania; suffice to say there were many of them. It was a lot of hard work but we made it. Dad (Arthur Alps) died in 1972, aged 63 and Mum (Katherine Alps, nee Smeeton) died in 1983, aged 69. Pleased to say both Mum and Dad lived long enough to see all their grandchildren born, the last one (John's son Danial) was just one month old when Dad died. I guess that was a small reward for all they went through during their married years. John still lives in Tasmania. Unfortunately his wife of 48 years died almost three years ago now. They had three children (two girls and a boy) and six grandchildren, who all still live in Tasmania. Margaret and I have three children (two boys and a girl) and five grandchildren. We live in Coolangatta, Queensland. Our eldest son lives in PNG, our youngest son and children live in Maitland (on the Hunter River near Newcastle) N.S.W. and our daughter and her family live in Perth, W.A. Personally, I think probably the most positive side of this saga is the way in which it has played out in a family, relationship and friendship dimension. After nearly 65 years we are still in close contact with family. As you know my eldest cousin (on my mother's side) and his wife Alan and Marie Sutton still live in the Barling area. His sister, Margaret Myles-Hook and husband, Roger, are also on this website. I have another cousin, Bob, on my father's side who lives in Hockley. It was only during my last visit that I found out that Maureen (Abrey) Petts also lives in Hockley. Maureen and her family lived just a couple of doors down from us in Mucking Hall Rd. She could not make it to the reunion but went to the trouble of coming back a day early from her holidays to catch up! Among the people I caught up with was Stanley Whitton who said his daughter was coming to live in Sydney. Told him if he visits to slip up to Coolangatta. Will be happy to shout him a couple of coldies! My wife, Margaret, also has an extended family still in the UK, so over the years there have been quite a few visits back and forth; including from the younger members of both sides of the family. This website has been a wonderful additional means of staying in touch and for trips down Memory Lane; especially to all of us who value our roots and wish to keep in touch with them. Taking a dip at sea!